#2 Copper Wire and Tubing and are some of the most common copper materials found in scrap yards and around construction sites. They consist mainly of copper tubing from plumbing parts and fixtures and HVAC parts and equipment, as well as copper wiring, generally found in construction sites from general electrical applications. For copper wires and tubes to be considered #2 Copper Wire and Tubing, they can consist of miscellaneous copper scraps with minimal soldering , iron attachments, brittle wire, and can contain copper connections. 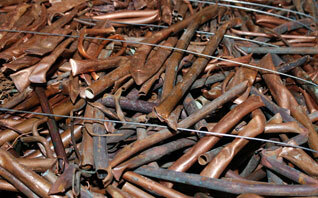 #2 Copper Wire and Tubing are considered to be very valuable scrap materials and can be sold to scrap yards and dealers at high prices, usually by the pound.